The traditional ladder design is stylish and simplistic, perfect for residential and commercial properties. The steel body offers Class II insulation with dry thermal technology. 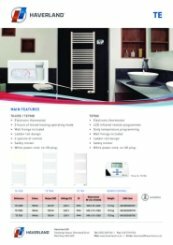 We offer a 13-step guide for DIY installation inside the provided instructional manual, however we recommend the services of a professional installer to ensure the radiator’s safety and superior performance. We provide an installation template, helping you to gain the perfect positioning of the Haverland’s anchor supports. To clean the product use abrasive cleaning powder or polish of any kind on the body of the heater. Haverland use dry thermal elements which provide silent heating and are 100% recyclable. They emit an even warmth, radiating heat effectively, and their dry technology allows them to heat up quickly. Efficiency can be improved by customising the programmable settings manually. The towel rail will then automatically come on and off, providing sufficient heat throughout the week. 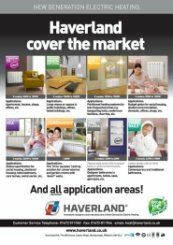 The Haverland radiator offers an optional infrared remote control, providing instant access to heat and setting modification. The inbuilt screen clearly displays ambient temperature readings and target temperatures. The keypad is lockable, ideal for environments involving children. 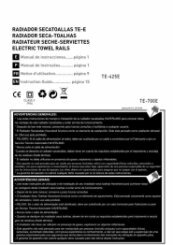 The safety limiter also reduces the surface temperature of the towel rail, ensuring safety while keeping towels warm. Thank you very much for the great review of our delivery service. Works great, will have to see how good it is when the weather gets colder. Delivered on time. Goods undamaged. Very happy with the one installed up to date. Thank you for the great feedback of our delivery service, it is very much appreciated. Nice looking heater with the advantage of a remote control, bought it for use in winter but during cold spells kept the room within 0.1C of the selected temp. Requires at least 2 people to fit it due to it's weight, needs a 8mm masonry drill for drilling the wall. Great product review, thank you. Delivered the next day before 1200 (extra cost of £3.50) within the 1 hour delivery time they supplied. 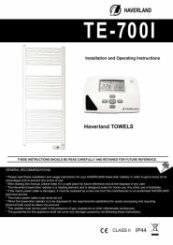 Brilliant, I am glad that we were able to deliver the Haverland TE designer electric towel rail so efficiently and quickly. Looks great, heats the bathroom great, not sure about how economical it is though because we haven't had the electricity bill yet! Programmer very complicated and window too small! Lady answering the phone very helpful but we are still waiting for a faulty part. We have spoken to you this morning to ascertain the problem and I believe that you have been talking to Haverland directly rather than us at Heater Shop - and, although this is a manufacturing issue, we have spoken to Haverland to speed things up for you and hopefully resolve this as soon as we can together. If you have any other problems, please do not hesitate to contact us on 01473 276686.